Hair in the 1940s was all about the soft waves and careful curls, and found a balance between glamorous and practical. Hair tended to be cut in a U-shape, and at a medium length - long enough to be feminine and versatile, but short enough that it could be pinned up in various ways. Hair was permed, pinned, rolled, and curled, and frequently accessorised with hats, headscarves, ribbons, snoods, hairnets, grips and combs. Pompadours and victory rolls were particularly popular. During the war, many women took on labour-intensive jobs working on farms, and in factories. This contributed to the popularity of shorter hairstyles - particularly towards the end of the decade - as long hair was deemed a safety hazard. The “Rockin’ 50s” as many fondly refer to it, saw a surge in the diversity of hairstyles, with post-war prosperity and the appeal of Hollywood glamour playing a large role in the rise of flamboyance and experimentation among current fashions of the time. The wavy/curly medium cut was a nod to the previous decade, while the emergence of the short, curly and classy “Italian haircut” (pictured), and the rise in popularity of the ponytail - favored by teens especially - are both examples of a classic 50s look. The increase in more voluminous hairstyles alluded to the emblematic craze of the decade to come. With the 1960s came the development of some of the most recognizable female hairstyles of the 20th century. There were several distinctive styles which occurred within this decade; the Bouffant (pictured); the beehive - which is still sometimes seen on formal occasions such as weddings and a-list events; and the classic 60s bob. Despite their unique differences, these hairstyles had many characteristics in common - comic volume, a sleek, rounded shape, and the distinguishing curls at the ends of the hair, either flipped up (see photo), or smoothly curved under. Bangs and fringes were very popular, as were wigs, bold accessories, headscarves and fake hair pieces which were often used to create the illusion of thicker hair. Towards the end of the 1960s, longer hair became a lot more common as a result of the Hippie subculture, which blossomed in the mid sixties and embraced a more carefree and natural approach to life. 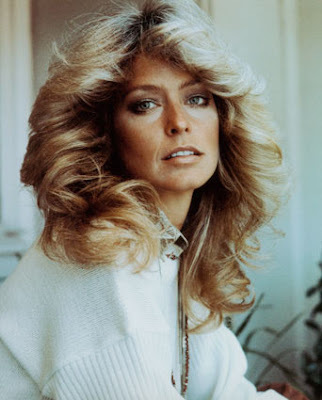 The 1970s was certainly the era of “Disco hair”, with the immense popularity of Farrah Fawcett’s flicked-back feathered style (pictured), which would eventually become the signature look for the seventies, beloved by both teenagers and adults. The seventies was also a big time for the afro, which was popular among the African-American community in particular, and eventually became as much of a fashion trend as a political statement, with both male and female African-Americans using the afro to endorse the nature of their natural hair as a symbol of black pride and self-empowerment. The 'centre part' is another style which also had its moment during the seventies. The 1980s was all about the big perm, blunt cut and heavily teased fringe - the bigger the better. The following of heavy rock bands and punk subculture contributed to a flurry of rebellious and outrageous hairstyles, which also included the mohawk and mullet. Red-dyed hair was very popular among young women of the time, with burgundy and plum shades in high demand during the eighties. The side ponytail was common among young girl of the time, and was often accessorized with coloured scrunchies. Big bows and coloured combs (known as “banana clips) were all the rage, making the 80s an era of some of the most colourful hairstyles. Grunge culture, Hollywood and hip-hop were all instrumental influences on hair trends of the 1990s. The rebellious edge of the 80s was still evident, but somewhat more understated, with grunge and post-punk movements contributing to the presence of short and spiky hairstyles on females. Hip-hop culture undoubtable played a role in popularity of cornrows, worn by both males and females of assorted ethnicities. Mini-buns, better known today as “space buns” also had their moment, as well as major nineties fad “The Rachel”, sported famously by Jennifer Aniston (pictured). Other similar “flippy” bobs found their mojo in the nineties. Hair in early 2000s, or “noughties” varied in length and was for the most part straight although loose curls and “beachy waves” have had their moment too. The early 2000s saw a distinct rise in the popularity of softly blended highlights and thick, chunky foils. The somewhat novel idea of choosing a hairstyle based on what flatters your own facial characteristics and complexion rather than current trends contributed to the wider diversity in styles, colours and cuts which we saw in the noughties.